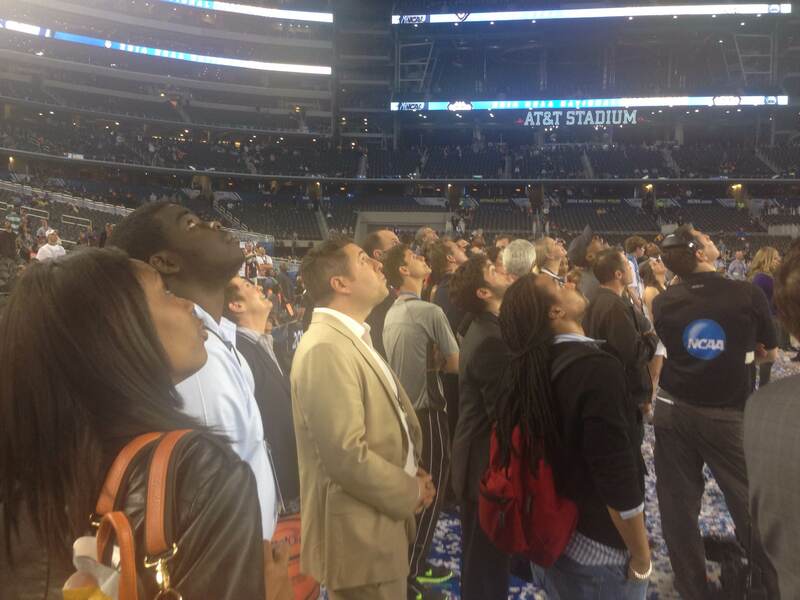 Members of the media watch “One Shining Moment” on the mammoth HD screen above the court at AT&T Stadium after the national championship game. AT&T Stadium is a domed football venue 20 miles away from the city where everyone’s staying, and this necessitates a media shuttle. Because I’ve skipped out on Media Day early to meet with Ken, I’m alone on the shuttle with the driver. He lives in Phoenix, and this is his first Final Four. “What time will the game end Monday night?” he asks me. I tell him it will end around 10:30 local time, but that media won’t be ready to leave the stadium until at least one in the morning and probably much later. This is not welcome news. Ken has told me he’s “wandering around downtown,” and to text him when I get there. I station myself on the sunniest corner of Elm and Field, and soon, coming down the street toward me in shorts and a ball cap, is the man himself, the pernicious influence who’s “deified” by too many impressionable young people nowadays. We make our way to the Union Park tavern on Main and settle down to compare notes. With an occasional exception, the “stats are great, no they’re evil” debate has now largely migrated to Twitter, and that in its own way is telling. The one genre that’s still unrepresented is that of the repentant onetime apostate. “How I Learned to See Through Advanced Stats for the Sham and the Lie They Really Are,” is as yet a pitch and not a finished piece. This suggests to me the dividing lines here may be more sociological than cognitive. The stats will never win unanimous approval — nothing but Bill Raftery will ever win unanimous approval — but it would seem they’re here to stay. Meaning the debate’s here to stay too. And while national writers will likely continue to flatter themselves that they’ll be the ones handing down this verdict either way, I can’t help feeling the question’s being rendered moot by some amazing beat writers. Speaking purely as a reader, I find much of the best “analytic” work being done today comes from these writers. When you’re embedded with a team and you know the dramatis personae so incredibly well, the value to be gleaned from a stray random piece of accurate piece of performance measurement is far greater than it is for a writer on the outside looking in. This is my first time in Dallas, and I wake up early to head into town and see Dealey Plaza. When the question being posed is “How do you acknowledge that a president was assassinated here?” I don’t know what the best answer is going to be. There likely is no best answer, but at a minimum the “X” painted on the pavement in the middle of Elm Street seems ill-advised. It has of course long been a spot where tourists pose for pictures (even though it’s in the middle of a busy street), and those photos won’t always be the last word in decorum. Is it really necessary to locate the tragedy so precisely within the plaza? We know what happened here. Aside from the “X,” however, Dallas has done a pretty good job in the face of an impossible situation. 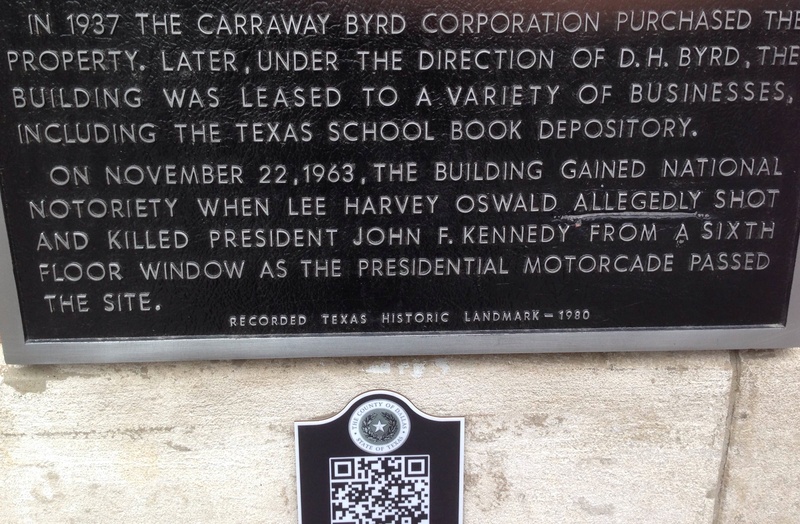 The School Book Depository has been preserved and houses a museum. The fence at the top of the grassy knoll has been rebuilt to match what was there in 1963, so that everything looks much as it was on that day and in the popular imagination for the half-century since. Angie’s List employs twice as many people in Indianapolis as the NCAA. What the latter employer pulls off annually therefore constitutes something on the order of an organizational miracle. With a full-time staff of just 500 employees give or take, the NCAA mounts one of the largest sporting events in the United States, one comprised of 67 basketball games played in 14 different cities over the course of 20 days. (And there is, of course, a women’s tournament happening at the same time.) In terms of head-count-to-enormous-task ratio this would be like entrusting the World Cup to the Toledo police department, yet somehow the NCAA succeeds brilliantly when it comes to event programming. The NCAA pulls this off with decades of hard-won institutional knowledge and an army of on-site volunteers. This year the March Madness Live app was fairly brimming with performance-measure accuracy, and the back-of-house app for the press corps was similarly excellent. If the NCAA is indeed fated to be rendered extinct by Ed O’Bannon, the NLRB or both, I could envision a goodly portion of the organization being hired in an instant by whomever is entrusted with the next tournament. A little after seven in the morning I’m working on a piece about how unique Kentucky’s tournament run has been in terms of both seeding (low) and margin of victory (very small), when the power goes out at the hotel. I document my plight with a couple tweets sent out over my phone (thinking to myself this will prove to my editor that I’m not just saying the dog ate my homework). Then I look out into the hallway and see that the lights are on — and not strange-looking emergency lights, either, but just the normal hall lights. So maybe something’s wrong with just my room, I think. I delete both tweets, and go downstairs to investigate. The investigation reveals the power really is out, so I head to the nearest Panera for breakfast, coffee, and wifi. I file the Kentucky piece from there and make it back to the hotel in time to get on the 9:45 shuttle to the stadium. The rest of the morning is devoted to Mark Emmert’s press conference. Emmert’s view of amateurism differs from mine, but say this for the man. He meets each question squarely. For a room full of questioners thoroughly accustomed to interview subjects failing to substantively address far less weighty queries (“Talk about how far your team has come this season”) this can come as something of a shock to the senses. 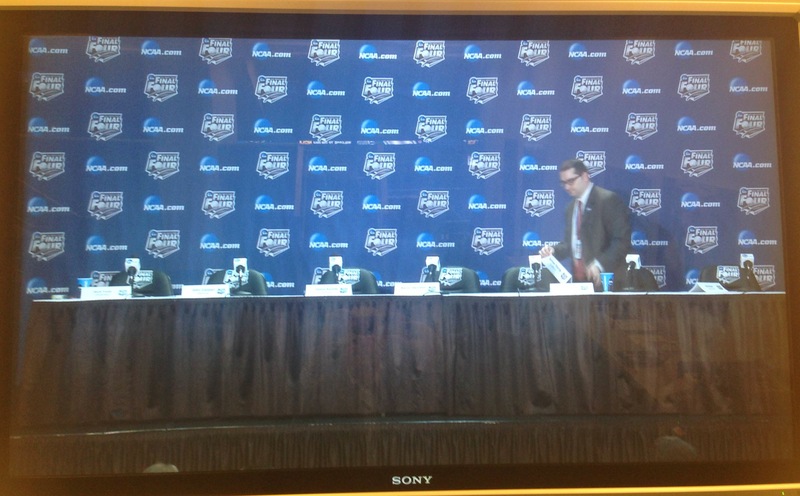 Not everyone who writes or talks about college basketball chooses to come to the Final Four, of course, but the press corps that does show up can be accommodated in a work room comparable in square footage to one decent-sized cafeteria at a university residence hall. It’s a surprisingly small world. ESPN has commandeered one half of one table in the corner of that room, and that’s where I run into Andy Katz for the first time that day, just back from a half-marathon. “I saw your tweet about the power going out this morning,” he tells me. “I thought, ‘I hope John’s staying at a different hotel. '” No such luck for Andy. A healthy share of the people who are going to write about this event are housed under the same roof, and that still leaves plenty of room for a swarm of fans from every school. It’s a surprisingly small world. That evening I have one last shot at getting to Mass, and Google reveals my best bet’s four miles away in a residential neighborhood near White Rock Lake. The sanctuary’s packed, and a goodly number of attendees are decked out in the colors of Connecticut, Wisconsin, Kentucky or Florida. My search terms were popular that evening. The streamers and confetti have dropped, the ball caps are out, and the ladders are being installed under the baskets. The press corps is allowed on the floor as long as we stay outside the respective three-point lines. I don’t want to get in the way of colleagues writing gamers on tight deadlines (I’ve already filed “Can UConn Repeat?”), but this is the national championship game. Of course I’ll go up there. I’ve been spotted by a colleague from my firm’s digital video side, and now he has thrust a microphone into my hand. A colleague of his has started taping. I ask Giffey how UConn kept Kentucky off the offensive glass, not because Giffey is a model of defensive rebounding prowess, but because I needed to ask a question and that was what struck me as interesting 15 minutes after the final horn. 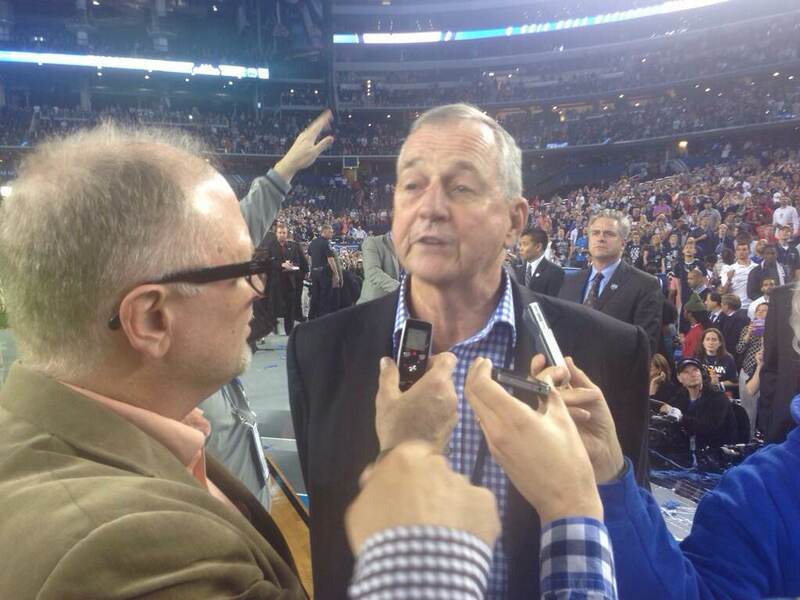 I talk to Jim Calhoun too. He has of course drawn a crowd, but not a Napier-crazy one. I ask him to compare this UConn team’s improbable run to a championship after a so-so regular season to his 2011 team’s improbable run to a national championship after a so-so regular season. I’m not thinking elegiac thoughts — I’m more concerned that the coach not step backward and topple off the raised floor — but in effect this question brings down the curtain on my 2013-14. This entry was posted in hoops on April 10, 2014 by johngasaway.